Delaware’s Health Information Network (DHIN) has selected IMAT Solutions to support Delaware’s State Healthcare Innovation Plan (SHIP). The IMAT Enterprise Data Foundation, Medical Research and Query Builder, and Clinical Analytics and Reporting modules will be integrated as core components of the overall solution. Delaware has been awarded a grant through the CMMI State Innovation Model (SIM) initiative to test its State Health Innovation Plan (SHIP)—which was developed with broad stakeholder input over the course of nearly two years of intense planning and collaboration. The major goal of the initiative is to improve health system performance for residents of participating states, yielding measurable improvements in the “Triple Aim” of enhancing patient experience, improving care, and lowering healthcare costs. Participants are on the leading edge of using analytics in healthcare to create a positive feedback loop of analysis, change, and review. A central element of the Delaware plan is the development of a scorecard that will be used by payers and providers in the state to indicate the performance of primary care providers in three key areas: adherence to accepted standards of care for a set of specific conditions that have the greatest impact on overall health of Delawareans; patient experience; and healthcare cost. Adoption of this set of core metrics by payers and providers will allow them to focus attention on a manageable set of key performance indicators with the highest potential to move the state in the direction of better health and lower costs. DHIN has selected IMAT Solutions to provide a secure system for aggregating, validating, and analyzing data from both payers and providers and presenting the results in a common scorecard user interface. IMAT will allow DHIN to rapidly capture these key metrics for its scorecard and to adjust to changing scorecard requirements, expanding network participation in the SHIP plan, and data growth over time. Additionally, DHIN will utilize the IMAT Enterprise Data Foundation module to leverage all of the data inside its Medicity Health Information Exchange platform to provide value added data services to its stakeholders. 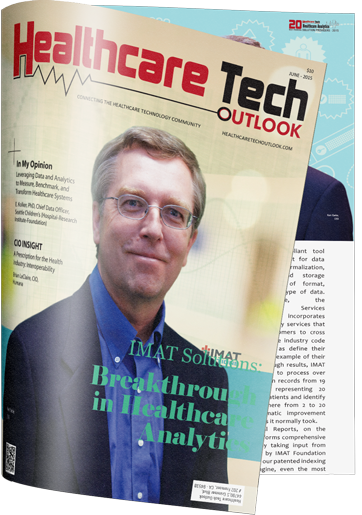 IMAT Solutions was formed in 2013 to provide key innovations in data accessibility, analysis, and reporting to healthcare organizations. IMAT helps improve care, increase efficiency, and decrease cost. IMAT’s modules, built on a breakthrough analytics platform that has over 10 patents, make it a flexible solution that can be tailored to each organization’s needs.